In early 1983, Ray Eppard, a young minister who had graduated from Rhema Bible Training Center in 1979, was serving in a church in his hometown of Elkton, VA. On January 9th, while traveling to a Full Gospel Business Men’s meeting at the Ingleside resort, God spoke to Pastor Ray to come to Staunton, VA and pastor a church. This calling was God’s answer to the prayers of many who had been praying for a Word-based church in the Staunton area. On October 2nd of 1983, the answer to those prayers was realized when the first service, for what was initially known as Staunton Victory Christian Center, was held at Montgomery Hall Park. 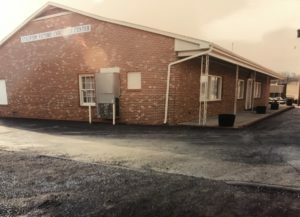 On November 6th 1983, the church held its first service in the lower level of an apartment building on D Street in Staunton, VA. In 1987 we purchased a facility located on Rt. 254 West of Staunton that had formally been a dance-hall beer joint. The first worship service at this location was held on Easter Sunday of 1987. This move caught the attention of the community, as evidenced by an article that appeared in the May 18th edition of Staunton’s Daily News Leader. Growth of the church came with the move to the new location. So in 1991 the facility on Rt. 254 W. was expanded. This growth was a reflection of God’s blessings on the church and was testimony that His Word will “grow and prevail”. Staunton Victory Christian Center had truly become recognized as a place where the light of God’s Word could be found, and He continued to enlarge the ministry. 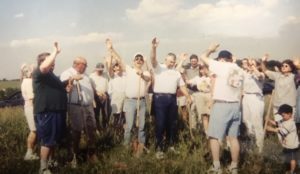 While on a trip to Rhema’s Camp Meeting, in the summer of 1997, God expanded the vision of our church. During a long, hot drive from Tulsa, God spoke some things into Pastor Ray’s heart concerning the future direction of the church. 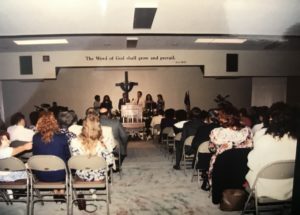 In January of 1998, the name was changed to Victory Worship Center and World Outreach to more accurately relate the expanded vision given by God for the ministry. Also in 1997, the church had begun to actively look for property on which to build. In February of 1998, the current property on Hammond Lane was purchased with the idea of beginning to build within 3 years. However, by the grace God, we didn’t begin to build in 3 years, we completed building in less than 3 years! On November 5th 2000, we held our first service in the Multi-purpose building located at Hammond Lane. In July of 2005, we began construction on a new sanctuary adjacent to the Multi-purpose building. On August 6th 2006, we held our first service in the current sanctuary. The ministry continues to grow and our congregation now includes well over 700 people. So there you have it, a brief history of how God birthed and nurtured our church. Throughout our history, He has blessed us, and we believe His blessings will continue as we continue in His service.